One million people visit Leavenworth annually to partake of its unique Bavarian village atmosphere replete with blaring Oompah bands, booming alpine horns, lederhosen-clad people dancing to polka music, and the tangy smell of German sausage and sauerkraut wafting through the air. Leavenworth’s visitors go river rafting down turbulent whitewater rapids, climb imposing rock formations, hike through superb alpine forest trails, and swoosh through pristine white snow on skiing trips. Now Leavenworth has added one more popular attraction for tourists and wine aficionados—wine tasting. With Leavenworth’s lively Front Street liberally sprinkled with tasting rooms that have sprung up in the past couple of years, the town can legitimately claim the right to call itself a bona fide wine tasting destination. Even better, this friendly alpine town offers a plethora of outstanding restaurants that serve up an eclectic variety of mouth-watering dishes to complement the fine wines poured on Front Street. One restaurant alone boasts a world-class assemblage of 450 different wine labels! Here’s a two-day getaway wine tasting walk of Leavenworth’s thirteen Front Street tasting rooms, all within a five minute walk of each other, that will please your palate with unique fruit wines, crisp Chardonnays and white varietals, and complex, bold red blends. The intimate tasting rooms and their friendly hosts provide a relaxing atmosphere and offer a great selection of wine accoutrements for the wine lover. What better place to start your Leavenworth wine tasting than with Ed and Pat Rutledge’s Eagle Creek Winery, Leavenworth’s first winery? This charming and interesting couple have been making wine for 17 years, and been in Leavenworth for the past ten years. They produce five reds and five whites. With a one-acre vineyard and 1100 vines, on their Eagle Creek location, they import 12 tons of grapes from Milbrandt, Sagemoor, and Bacchus Vineyards and produce about 4,000 cases each year. Eagle Creek is especially proud of its crisp, traditional German Riesling, and the rich, fragrant, spicy Montage (60% Cabernet Franc and 40% Merlot). Their smooth, dry Chardonnay, with its pear and citrus scents, is aged 6 months in American Oak; and their semi-sweet Adler Weiss (White Eagle) blend of Columbia Valley Semillon, Riesling, Pinot Grigio and Chardonnay is also very popular with the wine tasting crowd. If you want to live your wine tasting weekend to the max, book the gorgeously decorated Wine Suite at the Innsbrucker Inn that Pat owns and manages—it’s 20 paces from the nearest wine tasting room on Front Street. Located beneath the Leavenworth Starbucks, Okanagan Estate & Vineyards draws its fruit from its estate vineyards in Okanagan Valley. Winemaker Mike Buckmiller currently produces eleven wines and is primarily known for his sweet whites, including a sweet dessert late harvest Sauvignon with a nose full of tropical fruit including bananas, pineapple, and coconut with a lemon grass finish. The ultra-sweet dessert Chardonnay Ice Wine has a golden raisin aroma and ripe orchard fruit, and clover honey. Their signature red blend, the 2005 Bench Rock (39% Merlot, 33% Cabernet Sauvignon, 17% Syrah, and 11% Cabernet Franc) is barreled for 20 months and has a spicy aroma of spice and vanilla, with a hint of vanilla, and a juicy finish. Terry and Vivian Flanagan of Ryan Patrick Vineyards grow their grapes on 70 acres of land in Bishop (on the Columbia River) and 20 acres in Homestead (Quincy) that has been in the family for three generations. RPV’s first vines were planted in 1996 with the first release in 2001. Noted Washington winemaker Craig Mitrakul makes seven wines for RPV, and makes them well, judging by the awards that have come their way. All are estate made in their Cashmere winery. RP Vineyards’ top three selling wines include the Barbera, an ancient varietal with historical Italian roots, with a rich hue and gentle tannins, and a smoky taste with blackberry finish. The Reserve Cabernet Sauvignon has cherry, rhubarb and spice aromas, and is a good seller. But the Rock Island Red is a perennial favorite with the tasting crowd. This blend (50% Merlot, 39% Cabernet, 11% Cabernet Franc) has a black cherry, currant, and allspice aroma with a clean berry and cherry flavor, with a hint of vanilla bean and expresso coffee on the finish. The Swakane Winery, a boutique winery overlooking the Columbia River, produces three whites, three reds, and two dessert wines. Try the 2007 Riesling, with a hint of sweetness, mandarin orange, white peach and a mineral touch; and the 2007 Cabernet Sauvignon with licorice and black cherry aromas and a lingering coffee finish. Specializing in small productions of an eclectic selection of hand-crafted wines, owners Lou and Judy Wagoner and winemaker Don Wood of Icicle Ridge Winery make a diverse selection of reds, whites, and blends. Try their outstanding floral White Riesling with rose blossom and honeysuckle aroma, and a green apple and hint of lemon taste; and the Vintner’s Reserve Blend of 70% Cabernet Sauvignon and 30% Merlot. Their Chocolate Cherry Passion is a great pour on cheesecake or as a sipping dessert wine. I first met Rob Newsom and his wife Tamara on a wine cruise on the schooner Zodiac. Being a homespun Louisianan, Rob never has any trouble charming people with his southern accent and telling a few tall tales about Boudreaux Cellar’s namesake, a swamp Cajun who spins wild yarns and pulls pranks on friends and foe alike. Rob’s winemaking talent is evident when you taste his superb wines — he’s particularly proud of his chardonnay, merlot, cabernet sauvignon, and syrah. Rob buys his grapes from some of the best vineyards in the state including Bacchus, Champoux, Seven Hills, and Wallula Vineyards. For wine tasting, try his 2006 Merlot with a long delivery of sweet hickory smoke, licorice tobacco, and spice. “This could be the best merlot we ever produced”, says Rob. Or sip the 2006 Reserve Cabernet Sauvignon, with good horsepower, lots of fruit, good balance and finesse. The 2006 Cabernet Sauvignon shows lots of fresh fruit flavors, smooth tannins, cherries and blueberries, after 2 years aging in the barrel, then further aging in a 2000 -gallon French oak tank. Bob Richards of Bella Terrazza Vineyards is my kind of winemaker—he’s a no-nonsense horticulturalist and viticulturalist who grows his own fruit and makes 120 cases of wine annually, on site at his 8.5-acre vineyard. And he loves pouring his wines and discussing them with wine lovers of all kinds, especially wine tasting beginners. No pretentiousness here, just a love of the vino and meeting the people who enjoy it. Bob’s vineyard was planted in 2001, and he was licensed in 2006. Bob offers four reds and three whites, all of which sell equally well from his cozy downstairs cellar wine tasting room. Try the Cabernet Franc, with a hint of green peppers, a bold and fruity mouth and a plum and walnut finish; or his Estate Pinot Grigio, with an inviting bouquet of grapefruit and orange and subtle taste of berries and melon. 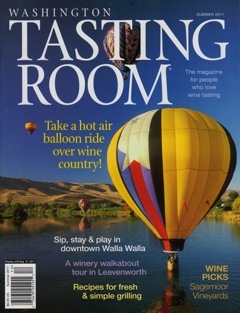 The oldest tasting room in Leavenworth, Kestrel Vintners is a young winery that has purchased some established vineyards in Yakima Valley. Kestrel is known mainly for its excellent reds, and is expanding into whites, with the popular, mild, Leavenworth White emerging as a solid seller. The dry Rose is an awesome, complex blend of Sangiovese, Syrah, Malbec, Cabernet Franc, Mouvedre, Grenache, Petit Verdot and Tempranillo. We also enjoyed the Lady in Red, brimming with intense, ripe black and red fruit flavors, and velvety soft tannins, and a lingering sweet finish. Vice President of Winemaking, Flint Nelson spent time in New Zealand learning the trade, and has clearly transferred his knowledge and experience to the Washington State terroir with excellent results. The Mathison family knows their fruit—they’ve been growing fruit for 100 years, or five generations, and Stemilt Fruits is the largest Cherry Packing Company in the world. Since starting winemaking in 2003, and opening their wine tasting room in Leavenworth in May 2010, the Stemilt Creek Winery has produced 14 different wines including Merlot, Cabernet, and Syrah. All of their wine is Estate grown. Another relative newcomer to the winemaking business, Bergdorf Cellars uses grapes from over 20 vineyards around Washington. Austrian winemaker John Delvo, uses traditional techniques for his handcrafted wines, producing over 4,000 cases each year—he’s been selling his wine since 2005. His reds are aged 36 months in French oak and naturally, he makes a spicy Gluhwein for the holiday season (served warm and delicious!) using an authentic Austrian recipe. Other wines in his repertoire include a low sugar Riesling, Chardonnay, Double Cabernet, and Malbec. His Ski Jump Red uses Cabernet Sauvignon, Cabernet Franc, and Tempranillo, and features a bouquet of sweet wood with hints of vanilla, cloves and dark cherries. Located upstairs in the same large room as Bergdorf Cellars, Baroness Cellars wines are made by Danielle Clements who produces 1200 cases each year. Her Mountain Meritage is very popular, a blend (25% 2006 Cabernet Franc, 25% 2008 Cabernet Franc, 50% Merlot) with a ruby red color, a hint of coffee and vanilla on the nose. Pasek Cellars was one of our top three tasting rooms and is renowned for its unique fruit wines ranging from the Cranberry (refreshing, crisp, light, good with spritzer); Raspberry wine (medium bodied with moderate sweetness); and Blackberry wine (medium sweet, fill bodied). The fruits are from the Skagit Valley, the Passionfruit from Peru, and Pineapple from Maui. Sure, you’ve had fruit wines before, but never like this. While other vintners blend their fruit with Gewürztraminer or Riesling, Pasek uses pure unadulterated fruit—no grapes at all. Do try the superb dessert wines like Loganberry, Raspberry, and Passionfruit, while you’re imagining what they’d taste like on ice cream or cheesecake. Located in same tasting room as Pasek Cellars, Willow Crest Winery is best known for its crisp Pinot Gris (hint of apple and pears) and Syrah (rich dark berries, a hint of smoke and lingering finish). All of Willow Crest’s wine is produced on their Prosser Estate. My palate must have been “on” for my recent wine tasting and gourmet food visit to Leavenworth, or maybe the clear alpine air boosted my taste buds, because everything tasted good to me. And it’s been a long time since I’ve been able to say that about all food and wine in any town. Leavenworth is rightfully proud of its new wine tasting rooms and fine dining. Go there immediately! Don’t miss Visconti’s for lunch or dinner. This is nirvana to the wine lover. Executive Chef Daniel Carr is justifiably proud of his amazing cellar with 450 different wine labels and authentic Italian recipes that taste oh, so good! With a 17-page long wine menu, Visconti’s has received awards of excellence from Wine Spectator magazine. Daniel Carr and his sous-chefs use a simple amount of fresh ingredients and cook in the Italian traditional style (he even cuts the steaks as they did 100 years ago). Dan’s visits to Italy have paid off—you won’t find a mediocre dish in the place. He even runs a curing cellar downstairs for his authentic meats and sells them in the “Cured Shop” downstairs. Try the Salumi Plate—it’s an experience—you won’t find salamis like these on the West coast. The creamy Gnocchi has just the right blend of potato, tomato, garlic and cheese. Dan uses only piedmontese beef, very lean and rare cattle. The cheeses are all local Washington product. Stop in for a sweet gelato downstairs for dessert. Of course, if you’re staying in Leavenworth you have to try a German restaurant, and Café Mozart is the ideal place to try a creative collection of Bavarian dishes including Sauerbraten (roasted Angus beef), Zwiebelrostbraten (grilled steak), and a “Symphony of Schnitzels” (veal, pork or chicken), all while listening to Mozart’s best. But one dish supersedes all others at Café Mozart: the Wolfgang Amadeus Platter for Two (which really has enough for four). This grand slam big botana has enough apple-pork bratwurst, cranberry pork bratwurst, falling-off-the-bone pork shanks, grilled Tyrolean ham, pork schnitzel, Lyonnaisse potatoes, spaetzle with mushroom sauce, and red cabbage and winekraut to feed you for hours. I promise that you will not be disappointed. Time your buffet breakfast at the Enzian Inn for 8:15 or 9:15 am, when their lederhosen garbed Tyrolean horn player walks quietly through the dining room, carefully stands atop the balcony rail (on the 4th floor), and booms out some Alpine horn tunes that resonate up and down Highway 2. When wine tasting it’s a good idea to try different foods, and fresh, modern, Latin food is ideal for reviving those overworked taste buds. Try the grilled Habanero Shrimp, Fajitas, Relleno Tropical (roasted poblano stuffed with cheese, plantains, sweet potatoes & pine nuts), Jamaican Jerk Chicken, or the Revolucion Shrimp Burrito. If you're in Leavenworth for wine tasting, book the Wine Room at the Innsbrucker Inn and enjoy the view overlooking Front Street by day and night. Browse the bookstore downstairs after wine tasting, then head off to dinner. For additional places to stay and other visitor information, go to www.leavenworth.org.